A lot of my Italian-style cooking is heavily influenced by what I see on Giada’s show on the Food Network. I saw this recipe a couple of days back and decided to make it. Here’s my version after a couple of modifications. Heat the oil in a large saucepan. Add the chopped onions, carrots, celery and garlic and sauté till the onions are translucent, and the other vegetables turn soft. Add all the spices, mix well and cook for a couple of minutes. Add the canned tomatoes and chopped basil and cook for another 5 minutes. Add the canned beans and cook for another 5 minutes. Season with salt and pepper, garnish with chopped herbs and serve hot. This spicy bean soup goes to Susan @ The Well-Seasoned Cook for her event- My Legume Love Affair. The soup is looking really good. Actually awesome. I may want to try it as soon as possible. seen a lot of cannellini beans in the blogosphere but never come across any in the stores.. looks nice! Giada has some great ideas. I like your modifications, TBC. This soup looks very easy to pull together and such a comfort for cold weather days. Thanks for your beautiful entry! Lovely beans soup! I made one a cpl. of days ago too, with cocnut milk and ginger. Will try your version sometime. 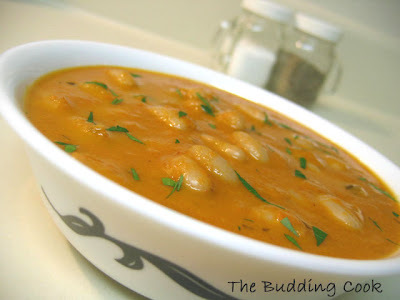 Am finally able to view and comment here :) Great looking soup... love it already!! Finally able to view and comment... hearty soup there!! Hey, I made ur garlic sauce... it is lip-smacking good! Susan, yeah, it sure is. :)...and thank YOU for hosting! Asha- thanks dear! It's nice to see u. Hope u are doing well and are finding the time to do everything that you need to and love. Even I a Giada fan and was introduced to Italian food by watching her shows on Food tv during my initial days in US. I too have seen that episode and thought of making...this looks so yummy....slurp! It looks so hearty and wholesome. Who can resisit this? Right now ,I have flu and I'll be surely happy if someone makes this for me. I love Giada's show and her recipes.